Horatio is a smart boy who can’t read. No way will he go to “special” classes. But go he does – and the results are amazing. Word puzzle and environmental links + fun stuff at the end. A year in the life of Big Mama and her cubs. Just pure boy fun. All the yucky action boys love! Ruthie becomes a brat after her parents move far from friends and family. Her moods grew big and ugly – like some hippo’s fat behind! Her parents tear their hair! What has happened to their darling child? Then a magic moment happens, and the old Ruthie returns. A ghost mystery set in Oregon. When Frannie and her twin brother move with their dad to Oregon, she has no thought of ghosts, hunting a killer, or a scary giant arachnid “familiar.” She just misses her mom, and worries that the sibling rivalry between her and her twin is becoming worse. Who could guess that emails and a frying pan would be all it took to catch a killer, and send a ghost to her Great Reward? 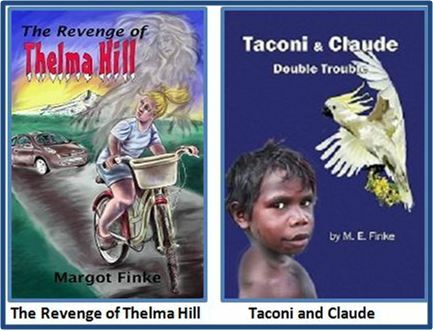 A coming of age adventure, set in the Aussie outback of 1950. Taconi, with advice from his sidekick Claude, a chatty cockatoo, has big decisions to make. His man ceremony looms, his dad is crazy, and the Dreamtime Spirits have plans of their own for him. Taconi’s future is at stake, and the magic feather that is supposed to make it all come out right is still firmly in the Blue Kingfisher’s tail. An educational 7x book series that tells fun facts about animals from the US and Australia. eBooks now – but coming soon in ‘Soft Cover’ from Guardian Angel Publishing. DOWN-UNDER FUN – discover more fun facts about the Aussie critters in her books.